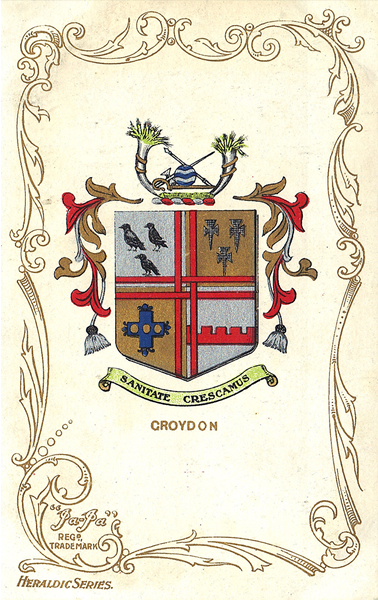 This map covers north Croydon and the area known, perhaps confusingly, as West Croydon, taking its name from the railway station. It covers an area stretching from Handcroft Road and Sumner Road eastward to Dartnell Road and Jesmond Road; and from West Croydon station northward to Selhurst station and Edith Road. Features on this busy map include numerous railway junctions (Norwood Fork Junction, Selhurst Junction, Windmill Bridge Junction, Gloucester Road Junction); Croydon Common Athletic Ground, home to Croydon Common FC and, for a while, Crystal Palace; Croydon Workhouse, Queens Road Cemetery, General Hospital, Croydon Union Infirmary; Addiscombe Road station. On the reverse are street directories for St James's Road, Sydenham Road, Whitehorse Road, Whitehorse Lane. You might find this Index map useful. The map links up with Surrey Sheet 14.02 Thornton Heath to the north, 14.05 Mitcham Road to the west, Woodside to the east, 14.10 Central Croydon to the south.